$400 Instant Savings. Expires May 2, 2019. * All prices reflect savings. Featuring The ancient capital of Athens, then 2 of the magical Greek Isles: Mykonos & Santorini; travel independently with flights, hotel & ferry included. Optional Classical Greece extension. There is nothing quite like the magical Greek Isles. Explore two of the best on this unique vacation package to Greece. 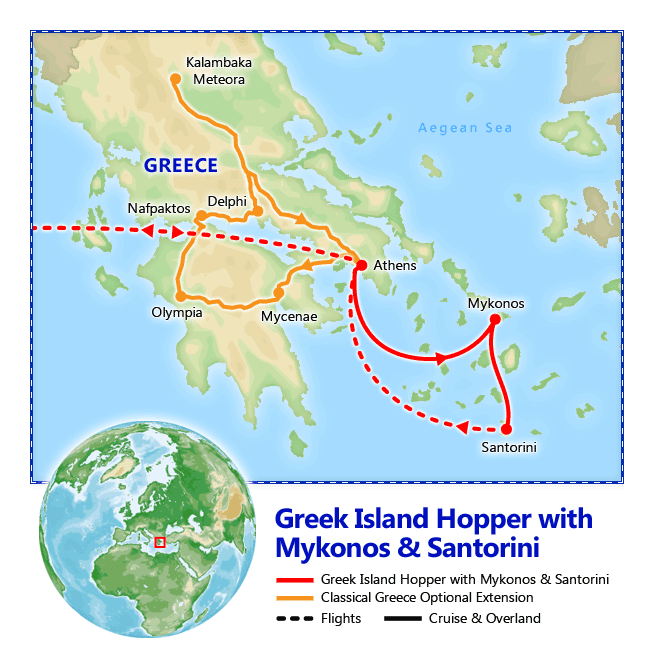 Unlike our ever-popular Greek cruises, when you travel to Greece on our "island hopper" getaway, you’ll spend several days on each island—a chance to really get to know and love them. This package is designed for the independent traveler, so you can choose to spend the days exploring the ancient secrets of the Greek islands, or just bask on the sun-splashed Mediterranean beaches. Spend the evenings dining, dancing and enjoying the famous nightlife. After two nights in Athens, the birthplace of western civilization, sail off into the Greek world of sparkling blue waters, Mediterranean sunshine and ancient islands full of history, myth, and wonders. 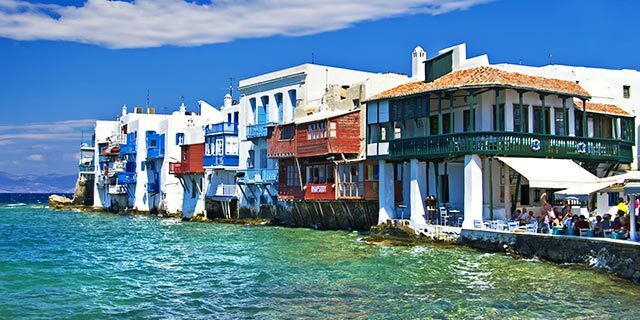 The first stop is beautiful Mykonos, with its white-washed houses and blue shutters studding the island, sparkling beaches and clear blue sea. Sail on to the legendary Santorini, with spectacular views of the sunken caldera and still-active volcano, black sand beaches, fabulous shopping alongside unspoiled villages. 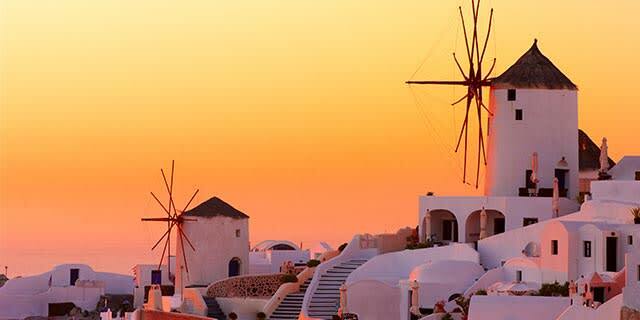 Enjoy the relaxing atmosphere of Greece and the Greek Isles, all at an incredible price. Instant Savings: Get $400 off if you book by May 2, 2019! 1. Overnight Stay Tax was implemented on Jan 1, 2018 by the Greek Ministry of Tourism. The tax is 2 Euro per person, per night in Athens and Mykonos, and 1.5 Euro per person, per night and payable directly to the hotel upon check-in. USD amount is listed as an approximation of the total cost per person: 16.5 Euro. Tax is paid in Euro. 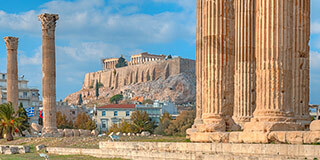 Accommodations: 2 nights Royal Olympic Hotel or similar, Athens. 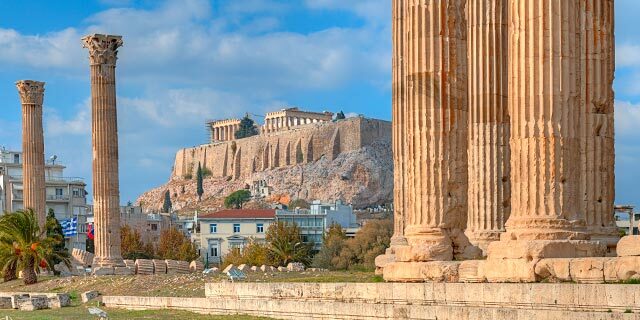 The striking contrast between breathtaking monuments of a glorious past and modern elegant structures is what you will enjoy during your tour of Athens. 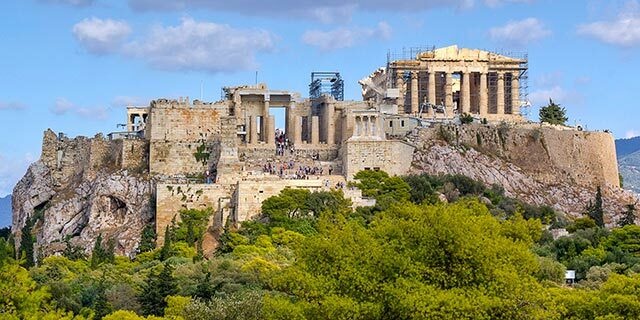 Visit the Acropolis, the crowning beauty and glory of Ancient Athens, with its many monuments atop its rocky base, including the awesome Parthenon, the Propylea, the temple of Athena Nike and the Erechtheion, with its Porch of Maidens. Drive to the Roman Temple of Olympic Zeus, the Panathinaikon Stadium (site of the first modern Olympic Games in 1896), and the Tomb of the Unknown Soldier in front of the Parliament House on Constitution Square. See views of government buildings and elegant structures of the 19th century. Drive along Panepistimiou Avenue and view the Catholic Cathedral, the Academy, the University, and the National Library. Conclude your tour with a visit to the new Acropolis Museum, a marvel of architecture with a full exhibition of the glory of Ancient Athens. 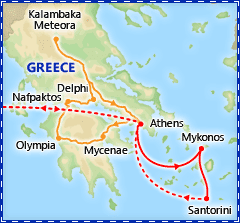 This afternoon, explore Athens on your own or join an optional excursion. Optional Excursion: Cape Sounion, $55. Drive along the coastal road past countless coves and the beautiful beaches of Glyfada, Vouliagmeni, and Varkiza to Cape Sounion. Dominated by the spectacular Temple of Poseidon, the sanctuary at Sounion is one of the most important archaeological sites in Attica. Although evidence suggests that the site dates back to the prehistoric period, the sanctuary is first mentioned in Homer's Odyssey, as the place where Menelaos stopped during his return from Troy to bury his helmsman, Phrontes Onetorides. Learn about the rich history of this area as you take in stunning views of the Aegean on this fascinating optional excursion. Accommodations: 3 nights Royal Myconian Resort & Thalasso Spa Center or similar, Mykonos. Included meals: Breakfast. 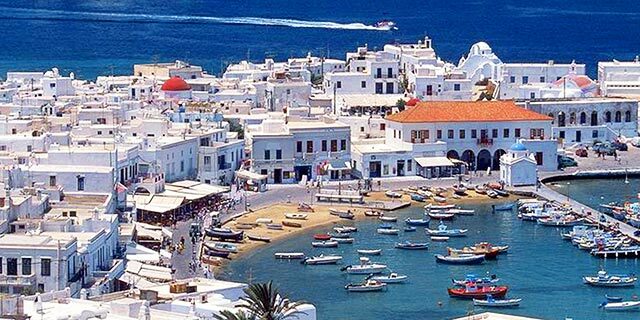 Full Day Itinerary: This morning, you'll be transferred to the port of Piraeus to board your ferry to the gorgeous island of Mykonos, where chic crowds flock to the beautiful beaches by day and to the trendy restaurants and discos each night. You'll be met and transferred to your hotel. The balance of the day is at leisure. 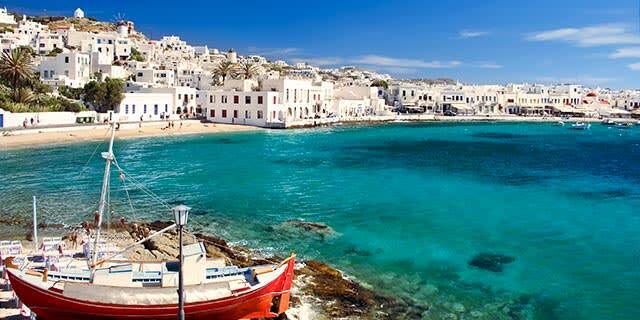 Full Day Itinerary: You'll have two days to independently enjoy the island of Mykonos. Stroll through the town with its labyrinth of winding alleyways and whitewashed buildings, upscale shops and cafes. Grab a seaside table and unwind, sipping ouzo and watching the sunset while listening to traditional Greek music. While on Mykonos, you may want to visit the nearby island of Delos, once the religious center of the Aegean and Cyclades. According to myth, on this island Latonna gave birth to Apollo, the Greek sun god, and Artemis, the huntress and goddess of marriage and fertility. 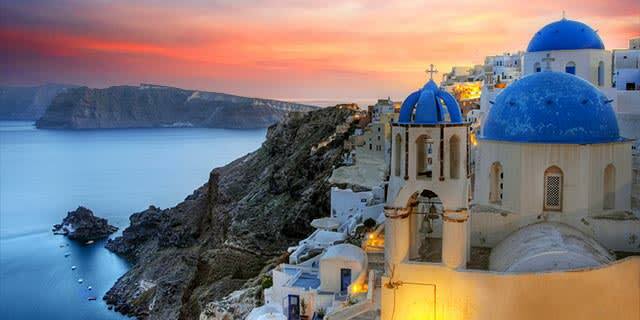 Accommodations: 3 nights El Greco, or similar, Santorini. Included meals: Breakfast. Full Day Itinerary: This morning, you'll be transferred to the port of Mykonos for your ferry to the island of Santorini. Upon arrival at the port of Thira, you will be met and transferred to your hotel on the cliff-side of Santorini, facing the famous Caldera. The balance of the day is at leisure. This striking island is a volcanic crater immersed in the sea. The island is famous for its breathtaking and rugged landscapes, whitewashed houses, open-air cafes and glittering boutiques which cling to steep cliffs, accessible by foot, cable car or mule. Your hotel is built into the cliff with steps to reach rooms and public areas. Full Day Itinerary: You will have two days to enjoy the island of Santorini on your own. Visit the bustling town of Fira, or even the smaller villages of Firostefani, Imerovigli and Oia. Or take an optional boat cruise to Nea Kameni and visit the still active volcano. Wherever you go, enjoy the spectacular views as the sun sets behind the caldera. Accommodations: 1 night Sofitel Athens Airport or similar on all others. Included meals: Breakfast. Full Day Itinerary: Today, transfer to the airport on Santorini to board your flight back to Athens. Upon arrival, collect your luggage and check into your airport hotel conveniently located just a short walk from the arrival & departure terminals. Why not take advantage of your already-included international airfare and visit the classical cities of Corinth, Mycenae, Olympia, and Delphi? Your extension includes superior hotels, most meals and guided touring of the most fascinating sites, including entrance fees to places visited. Full Day Itinerary: This morning you'll tour the archeological site and museum at Olympia, where the Olympic Games were conceived as a tribute to Hercules, son of Zeus. These games were the most important international event in the Hellenic world from 776 B.C. to 393 A.D. and continue today, with the lighting of the Olympic flame that is carried by runners throughout the world. Visit the Sanctuary of the Olympian Zeus and the Museum.